Your prophetic Word has shown us that, after the Last Judgment, Your faithful people will inherit a magnificent dwelling place, the New Jerusalem. May this lesson help us to learn more about this wonderful city, and cause us to work more ardently in Your harvest. And God saw every thing that He had made, and, behold, it was very good. When God created the earth, it was perfect. And on this perfect earth, in the garden of Eden, He placed the newly created man and woman, so that they might enjoy all the wonders surrounding them. Unfortunately, because they chose to disobey their Creator, they were no longer allowed to stay in Eden. But, in His infinite love, God set up His plan of salvation in Jesus Christ, so that they might, one day, return to paradise. And if I go and prepare a place for you, I will come again and receive you to Myself; that where I am, there you may be also. Jesus repeated that promise: there really is a place prepared for those who follow God, a place where they will spend eternity. It is, therefore, reasonable to allow one lesson simply to have a better knowledge of the place where we could spend eternity! By faith [Abraham] sojourned in the land of promise, as in a strange country, dwelling in tabernacles with Isaac and Jacob, the heirs with him of the same promise. But now they desire a better country, that is, a heavenly. Why God is not ashamed to be called their God: for He has prepared for them a city. Abraham, his household, and his descendants knew that the real Promised Land was more than a piece of land in Canaan. They were waiting for an infinitely superior heritage: the heavenly city which God has prepared for His people. For our citizenship is in heaven. The New Testament also confirms that God has prepared a glorious heavenly city for His people. But you are come to Mount Sion, and to the city of the living God, the heavenly Jerusalem, and to an innumerable company of angels. And I John saw the holy city, New Jerusalem, coming down from God out of heaven, prepared as a bride adorned for her husband. This heavenly city is the New Jerusalem. After the Last Judgment and the final destruction of the wicked, the city will descend to the new earth. But be you glad and rejoice for ever in that which I create. «Behold, the tabernacle of God is with men, and He will dwell with them, and they shall be His people, and God Himself shall be with them, and be their God.» Like the earthly sanctuary, built by Israel so that God might dwell among His people, the New Jerusalem will serve as a tabernacle, an eternal and perfect sanctuary, in which God will dwell with His people forever. And [the angel] carried me away in the Spirit to a great and high mountain, and showed me that great city, the holy Jerusalem, descending out of heaven from God. The New Jerusalem is the «great mountain» mentioned in the prophecy of Daniel chapter 2. The God of heaven shall set up a kingdom, which shall never be destroyed: and the kingdom shall not be left to other people, but it shall break in pieces and consume all these kingdoms, and it shall stand for ever. And her light was like to a stone most precious, even like a jasper stone, clear as crystal. Prophecy goes on with the description of the New Jerusalem’s architecture. Our imagination can’t possibly conceive the sublime beauties this city will display for the happiness of God’s people living there. I will make your pinnacles of rubies, your gates of crystal, and all your walls of precious stones. And he that talked with me had a golden reed to measure the city, and the gates thereof, and the wall thereof. Unlike the temple and its outside court trampled under foot, which were measured with a plain reed, God’s holy city is measured with a golden reed. And the city lies foursquare, and the length is as large as the breadth. The length and the breadth and the height of it are equal. Since a furlong is equal to 606 feet (185 metres), 12,000 furlongs represent 1,379 miles (2,218 kilometres). 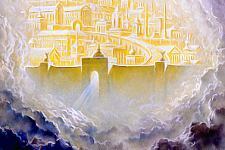 So the New Jerusalem covers a huge area, and rises to the same height, like an immense mountain, shining and glorious. And the city was pure gold. Being square-shaped and overlaid with pure gold, the New Jerusalem, which is God’s temple, is like the Most Holy Place of the earthly sanctuary. [Solomon] prepared the inner sanctuary inside the temple, to set the ark of the covenant of the Lord there. The inner sanctuary was twenty cubits long, twenty cubits wide, and twenty cubits high. He overlaid it with pure gold. And [the angel] measured the wall thereof, a hundred and forty and four cubits, according to the measure of a man, that is, of the angel. The city’s wall measures 144 cubits, that is, 210 feet (64 metres). This reminds us of the 144,000 faithful ones who make up the Israel of God. And I heard the number of them which were sealed. And there were sealed a hundred and forty and four thousand of all the tribes of the children of Israel. And [she] had a wall great and high, and had twelve gates, and at the gates twelve angels, and names written thereon, which are the names of the twelve tribes of the children of Israel: on the east three gates; on the north three gates; on the south three gates; and on the west three gates. Just like the 144,000 who are taken from the twelve tribes of Israel, the twelve gates of the city are named after the twelve tribes of Israel! The gates of the city shall be after the names of the tribes of Israel: three gates northward; (...) and at the east side, (...) three gates; (...) and at the south side, (...) three gates (...); and at the west side, (...) three gates. And the twelve gates were twelve pearls: every several gate was of one pearl. The gates of the New Jerusalem, each being composed of one pearl, recall this parable of Jesus, teaching us that no sacrifice is too great to obtain our eternal home in the glorious city of God. Again, the kingdom of heaven is like to a merchant man, seeking goodly pearls: who, when he had found one pearl of great price, went and sold all that he had, and bought it. And the foundations of the wall of the city were garnished with all manner of precious stones. The twelve foundations of the wall, made with various precious stones, are also named after victorious people: the twelve apostles. Why did God choose these names for the twelve foundations of His city? You shall call your walls Salvation, and your gates Praise. According to the grace of God which is given to me, as a wise master builder, I have laid the foundation, and another builds thereon. But let every man take heed how he builds thereupon. For other foundation can no man lay than that is laid, which is Jesus Christ. God chose these names for the twelve foundations of the New Jerusalem because the apostles, resting on the chief cornerstone which is Jesus Christ, founded the Church. [You] are built on the foundation of the apostles and prophets, Jesus Christ Himself being the chief cornerstone. And the city had no need of the sun, neither of the moon, to shine in it. For the glory of God did lighten it, and the Lamb is the light thereof. The glory of God and the coming of eternity will make the heavenly bodies unnecessary, since the sun and moon were «for seasons, and for days, and years» (Genesis 1:14). The sun shall be no more your light by day; neither for brightness shall the moon give light to you. But the Lord shall be to you an everlasting light, and your God your glory. And the gates of it shall not be shut at all by day. For there shall be no night there. Since evil will be banished forever, the city’s gates will always be open. And now, what does the coming of «the wealth of the Gentiles and their kings in procession» mean? Therefore your gates shall be open continually. They shall not be shut day or night, that men may bring to you the wealth of the Gentiles, and their kings in procession. And they shall bring the glory and honor of the nations into it. In our lesson «The Loud Cry», we have seen that, before the close of probation, a last evangelical work will present the light of truth with power, as never before, leading a great multitude to accept God’s call to salvation. The Gentiles shall come to your light, and kings to the brightness of your rising. And there shall in no wise enter into it any thing that defiles, neither whatever works abomination, or makes a lie: but they which are written in the Lamb’s Book of Life. Revelation chapter 21 ends just like chapter 20, by showing the sad consequences of not having one’s name in the Lamb’s Book of Life. And whoever was not found written in the Book of Life was cast into the lake of fire. And [the angel] showed me a pure river of water of life, clear as crystal, proceeding out of the throne of God and of the Lamb. First, all those who have not forsaken God, the Source of living water, will be allowed to drink at the pure river of water of life, which will flow through the New Jerusalem. The Lamb which is in the middle of the throne shall feed them, and shall lead them to living fountains of waters. In the middle of the street of it, and on either side of the river, was there the tree of life. Then, just as Jesus promised to him who overcomes, the people of God will regain access to the tree of life. And why do we say «regain» access? To him that overcomes will I give to eat of the tree of life, which is in the middle of the Paradise of God. «Behold, the man is become as one of Us, to know good and evil: and now, lest he put forth his hand, and take also of the tree of life, and eat, and live for ever,» therefore the Lord God sent him forth from the garden of Eden, to till the ground from from where he was taken. So He drove out the man; and He placed at the east of the garden of Eden Cherubim, and a flaming sword which turned every way, to keep the way of the tree of life. Man will regain access to the tree of life, because this tree of life was in Eden, out of which man was driven because of his sin. In the middle of the street of it, and on either side of the river, was there the tree of life, which bore twelve manner of fruits, and yielded its fruit every month. And the leaves of the tree were for the healing of the nations. Since illness will be no more, the «healing» provided by the tree of life is the light and the life which Jesus, our Sun of righteousness, will give us. But to you that fear My name shall the Sun of righteousness arise with healing in His wings. And there appeared a great wonder in heaven; a woman clothed with the sun, and the moon under her feet, and on her head a crown of twelve stars. We have often seen in our lessons that the number 12 symbolizes the eternal covenant between God and men. Blessed are they that do His commandments, that they may have right to the tree of life, and may enter in through the gates into the city. It is high time we reserved our place in God’s City. We must wash our robes in the Lamb’s blood, that is, allow God to purify our hearts through the sacrifice of Jesus, the Lamb of God, and then follow Him until the end. Therefore are they before the throne of God. He that overcomes shall inherit all things. Jesus will help us to overcome, if we entrust our lives to His hands. Your promise is so wonderful that we may find it difficult to believe. Yet Your Word says, «Behold, I make all things new. (...) Write: for these words are true and faithful.» (Revelation 21:5). We truly desire that our names be written in Your Book of Life. Please help us to faithfully follow You with perseverance until the end, until the day You give Your people the New Jerusalem for their inheritance. The test of Lesson 96 is waiting for you! Screen 1: JOHNS, Chris. «Landscape standing out against the shadow». In: «National Geographic Photo Gallery», National Geographic Interactive, 1997. Screen 2: MANISCALCO, Joe. In: «Images from the Bible and Sacred History CD», Chosen Works, MLI Software, JM006.BMP. Screen 3: In: «Egermeier’s Bible Story Book» (EGERMEIER, Elsie E.), The Warner Press, 1963, p.426. Screen 4: In: «The Bible for Children - Retold by Bridget Hadaway & Jean Atcheson», London, Octopus Books Limited, 1973, p.25. Screen 5: RUDEEN, Herbert. In: «The Bible Story, volume 1» (MAXWELL, Arthur S.), p.137. Used by permission. Copyright ©1953, 1981 by Review and Herald® Publishing Association, USA. All Rights Reserved. Screen 6: PROVONSHA, Clyde. In: «God Cares, volume 2» (MAXWELL, C.Mervyn), Pacific Press Publishing Association, 1985, p.506. Screen 7: ANDERSON, Harry. In: «The Triumph of God’s Love, volume 2» (WHITE, Ellen G.), Pacific Press Publishing Association and Review and Herald Publishing Association, 1950, p.580. Screen 8: In: «Revelation Seminars», Seminars Unlimited, 1986, lesson #8 («L’Étonnante Cité Spatiale de l’Apocalypse»), p.1. Screen 9: BISHOP, Tom. «Stone strikes feet of image». In: «New Pictoral Aid For Bible Study» (BREADEN, Frank), Australian Division of Seventh-Day Adventists, 1970, chart #7. Screen 10: ANDERSON, Harry. In: «The Bible Story, volume 6» (MAXWELL, Arthur S.), p.65. Used by permission. Copyright ©1955, 1983 by Review and Herald® Publishing Association, USA. All Rights Reserved. Screen 11: In: «La Révélation - le grand dénouement est proche», New York, Watch Tower Bible and Tract Society, 1988, p.163. Screen 12: In: «La Révélation - le grand dénouement est proche», New York, Watch Tower Bible and Tract Society, 1988, p.302. Screen 13: BISHOP, Tom. «The Earthly Sanctuary - Interior (detail)». In: «New Pictoral Aid For Bible Study» (BREADEN, Frank), Australian Division of Seventh-Day Adventists, 1970, chart #30. Screen 14: In: «The Bible for Children - Retold by Bridget Hadaway & Jean Atcheson», London, Octopus Books Limited, 1973, p.304. Screen 15: In: «La Révélation - le grand dénouement est proche», New York, Watch Tower Bible and Tract Society, 1988, p.307. Screen 16: In: «La Révélation - le grand dénouement est proche», New York, Watch Tower Bible and Tract Society, 1988, p.315. Screen 17: In: «The Bible Story, volume 10» (MAXWELL, Arthur S.), p.207. Used by permission. Copyright ©1957, 1985 by Review and Herald® Publishing Association, USA. All Rights Reserved. Screen 18: In: «The Bible for Children - Retold by Bridget Hadaway & Jean Atcheson», London, Octopus Books Limited, 1973, p.222. Screen 19: Picture from: «The Gemological Institute of America». In: «God Cares, volume 2» (MAXWELL, C.Mervyn), Pacific Press Publishing Association, 1985, p.532. Table of Screen 19: ANDERSON, Harry. In: «The Bible Story, volume 10» (MAXWELL, Arthur S.), p.156. Used by permission. Copyright ©1957, 1985 by Review and Herald® Publishing Association, USA. All Rights Reserved. Screen 20: In: «Revelation Seminars», Seminars Unlimited, 1986, lesson #7 («Le Diable Enchaîné dans un Abîme»), p.1. Screen 21: TORA, Carlo. In: «The Nelson’s Picture Bible», Thomas Nelson Inc., 1973, p.413. Screen 22: In: «La Révélation - le grand dénouement est proche», New York, Watch Tower Bible and Tract Society, 1988, p.61. Screen 23: BISHOP, Tom. «The New Earth». In: «New Pictoral Aid For Bible Study» (BREADEN, Frank), Australian Division of Seventh-Day Adventists, 1970, chart #12. Screen 24: DORÉ, Gustave. In: «La Bible de Gustave Doré», Lausanne, Edita, 1994, p.381. Screen 25: In: «La Révélation - le grand dénouement est proche», New York, Watch Tower Bible and Tract Society, 1988, p.57. Screen 26: In: «La Révélation - le grand dénouement est proche», New York, Watch Tower Bible and Tract Society, 1988, p.308. Screen 27: In: «La Révélation - le grand dénouement est proche», New York, Watch Tower Bible and Tract Society, 1988, p.309. Screen 28: DORÉ, Gustave. In: «La Bible de Gustave Doré», Lausanne, Edita, 1994, p.9. Screen 29: KNOX, John. In: «Ministry» magazine (June-July 2000), Seventh-day Adventist Ministerial Association, p.6. Screen 30: In: «Egermeier’s Bible Story Book» (EGERMEIER, Elsie E.), The Warner Press, 1963, p.567. Table of Screen 30: First picture: ORR, Georginna. «To God be the glory» (1981). In: «Revelations - Art of the Apocalypse» (GRUBB, Nancy), Abeville Press Publishers, 1997, p.75. Second picture: BRICE, Norman. In «La Sentinelle» magazine (October 1992), Pacific Press Publishing Association, p.6. Screen 31: HARLAN, Russel. In: «Revelation 12-13: The Church and its Foes», G.C. Ministerial Association, 1976, p.1. Screen 32: BARALDI, Severo. In: «The Bible for Children», New York, Barnes & Noble Books, 1994, p.301. Table of Screen 32: In: MAXWELL, Arthur S., «The Bible Story, volume 10», p.207. Used by permission. Copyright ©1957, 1985 by Review and Herald® Publishing Association, USA. All Rights Reserved. Screen 33: RUDEEN, Herbert. In: «The Bible Story, volume 8» (MAXWELL, Arthur S.), p.146. Used by permission. Copyright ©1956, 1984 by Review and Herald® Publishing Association, USA. All Rights Reserved. Screen 34: KNOX, John. In: «Ministry» magazine (June-July 2000), Seventh-day Adventist Ministerial Association, front cover. Screen 35: FARLOW, Melissa. «Snow-capped Mountains». In: «National Geographic Photo Gallery», National Geographic Interactive, 1997.